Love camping here because it's away from EVERYTHING. Sitting by the campfire, you hear nature. With no electric sites, the only light is given by your campfires and lanterns. It's a pretty unique experience. The roads needs to be redone, and the showers could be updated, but for those wanting to be immersed in nature, you can't beat it. 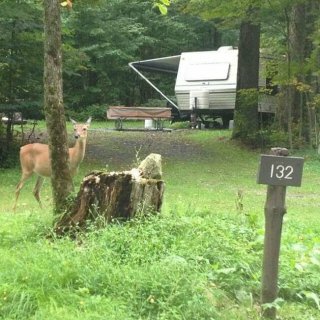 We camped at Bowman Lake State Park in a Travel Trailer. This place is so classy they use two ply toilet paper in all their bathrooms! The facilities are top notch, with a heated pool, a hot tub, a playground, fishing pond, and whatever else you may need for your camping pleasure. We had issues with the WIFI, but really, we're camping! is it really that big a detriment? So why did we rate it an 8 instead of a 10??? Well, there was this train track... The trains run 24/7 and there is an intersection near the campgrounds (perhaps a 1/2 mile or so away), which require them to blow their whistle. I believe I was awakened every morning in this fashion. It wasn't a huge issue, but it is a constant, as there were times the trains were passing by every 15-30 minutes. There also is a large power line that disects the campground, and a few people were camping almost directly underneath it. Granted, I realize there is nothing they could do about that, but it just didn't look like it belonged, and I personally wouldn't want to camp near it. With all that being said, we would definitely go back! The negatives are easily overlooked when looking at all the positives, because the people who run this place do a first rate job. We camped at The Villages RV Park at Turning Stone in a Travel Trailer. 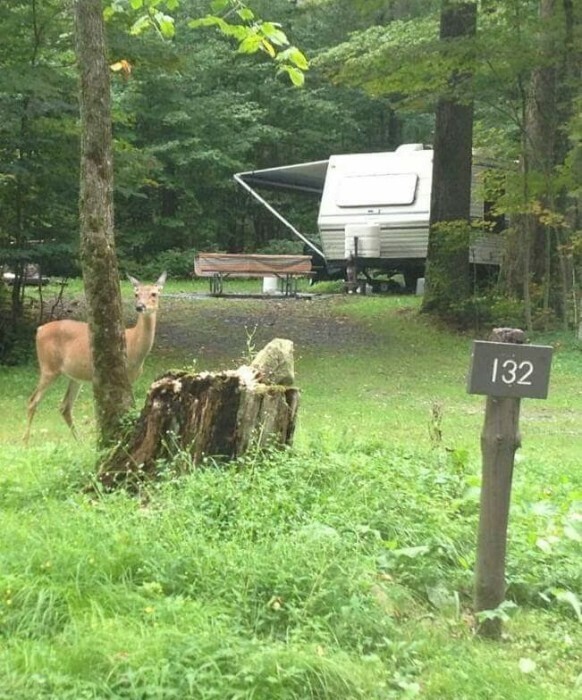 You aren't going to be backing into a Darien Lake Camp site thinking "Wow, what a great camp site!" We spent the night there because the park has a Halloween theme going on, and we thought the kids would enjoy it. We got a shaded site, which also means no grass. the bathrooms were pretty bad as well. On the positive side, the kids had a great time at the park, which was the main reason we went. If you're going camping at Darien Lake thinking you're going to get a great camping experience, you're going to be disappointed. The sites aren't great, the bathrooms are gross, and there can be parties going on late into the night (they do have a family section though, where we camped). If you go there just as a place to lay your head so you can go to the park for more than one day, it'll work though. On a side note, one thing that bothered us is that when we registered online to camp there, you have no say in what camp site you get! they randomly pick one for you when you get there. Next time we go there, we're thinking we're better off renting a camper that's already on site. the rental sites are much nicer, and with us being 3+ hours away, the cost of gas makes this a much more affordable idea. 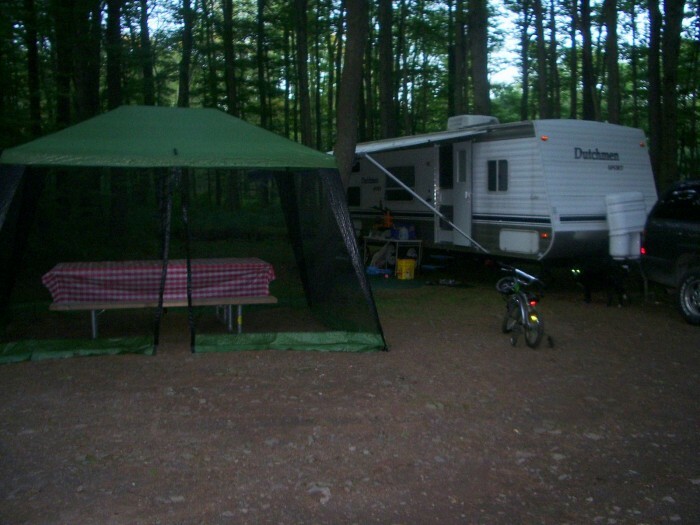 We camped at Darien Lake Campground in a Travel Trailer. 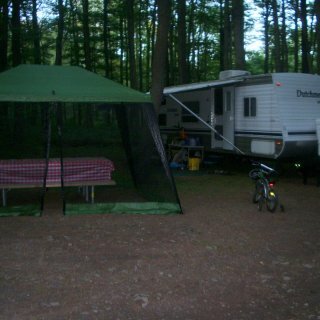 We just returned from camping here, (due in large part to reviews read here) and we came away quite impressed. We camped in the 700 loop, (site 739 to be exact. We highly recommend it!) which was one of the 3 loops that allowed dogs. (100 and 200 loops are the other two). The camp site was great, with enough room for 2 kids under 4 to play, and still leaving enough room for the dog to co-exist as well. We also have a 10 year old and a 12 year old, they were entertained with the rec center and the activities provided. Like other reviewers have stated, there is no local water for each trailer, but there is a place to connect fairly close by. A very minor inconvenience. The location of the campgrounds are nice as well. We were less than an hour from Darien lake, so we were able to spend a day there. We also we able to attend the Buffalo Bills training camp, which is located near Rochester. There are also two pools available for use, on both ends of the park (both are quite a bit a ways from the camping area). The one near the dam has two pools, one which goes to about 4 1/2 ft deep, the other strictly for diving. The pool near the falls is quite a bit smaller. We didn't go to this one, so I can't say much about it. Be advised, there is a fee to use the pools. The sites around Letchworth state park are amazing too! Being born in the state of New York, it was hard for me to believe I was still in my home state. The gorge and waterfalls are beautiful, and my wife and I are already planning a trip in the fall to appreciate the turning of the leaves. We camped at Letchworth State Park in a Travel Trailer.